Using anecdote as a method to generate a collection of poetry, critical fictions and literary fragments this book performs a response to the history and function of the Women’s Art Library. The stories segue through the archive of personal correspondence, artists’ slides and administrative papers, as well as a poster archive documenting exhibitions, parties and activism in 1980s Feminist art movements. Anecdotal, gossiped and mistreated histories form aberrant narratives as a result of an inverted mode of archival research. These stories, poems and fragments were composed through engagement with the Women’s Art Library in 2014, with the support of a bursary ‘Living with Make: Art in the Archive’ that was co-funded by WAL and Feminist Review, in association with Whitechapel Gallery. 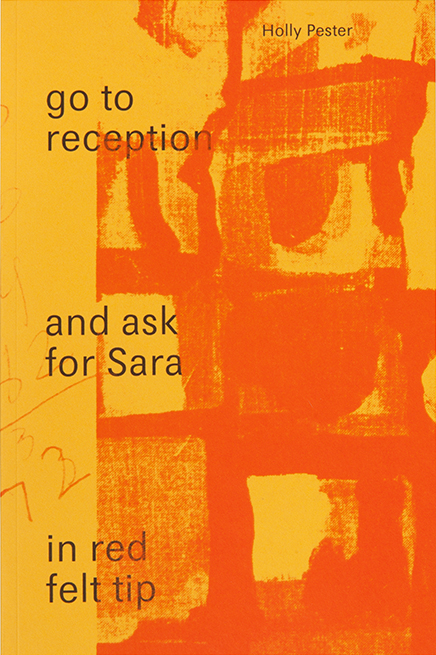 Go to reception and ask for Sara in red felt tip by Holly Pester, is published by Book Works in association with the Women’s Art Library, Goldsmiths, University of London in an edition of 1,000 copies. Designed by James Langdon; 112 pages, soft cover.